In this blog post we will analyze Flipp‘s business model canvas. Flipp can be best described as a shopping application with flyers, coupons, and shopping list (soon to be adding a lot more features). The company recently raised an impressive $61M in funding after their previous $1M round. The method for this analysis is via a business model canvas – a framework that charts various elements of the business that come together to create value – a business. More importantly, you will come to understand how all of these elements relate and support one another. If you are a visual person, here is a video overview. For text, please scroll down to the next section. 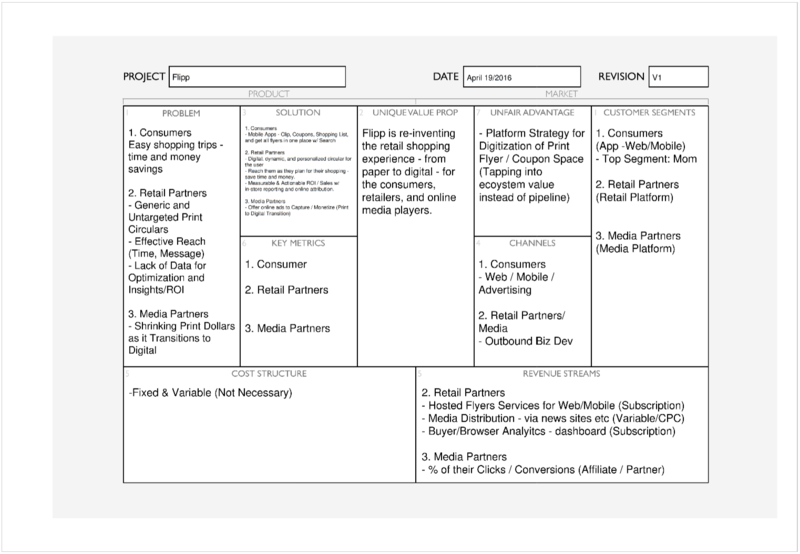 Here is the business model canvas of flipp. It includes customers, problems, solutions, unique value proposition, unfair advantage, channels, cost and revenue streams. I hope to go in more detail regarding the startups in retail and grocery space in the near future. Having worked in retail, B2B software, and ecommerce, I am particularly excited about the innovations that startups and new companies are (or will) bring to this space. I have first had experience in working for a retailer that was once the largest chain in Canada – Zellers. Over the 3+ years I worked for them, I experienced how the digital competitive landscape changed the game and we failed to engage the customers. This space will remain one of my “itches” that I hope to scratch in the near future. Keep an eye on latest Food / Retail / Grocery Startups – Doing this will help you build a gut of where the industry is going. I do that by keeping an eye on retail startups on crunchbase. Read annual reports or Press Releases of Public Retail Companies – This will give you a sense of where they see opportunity and what they classify as risk in their public-facing documents. Talk to Executives in the Field – Reach out to people and experts who are at the forefront of this field. I have had success by getting mentored by some of the best co-founders and entrepreneurs in this space – both successful and unsuccessful.